Have I got a gorgeous polish for you guys, today! 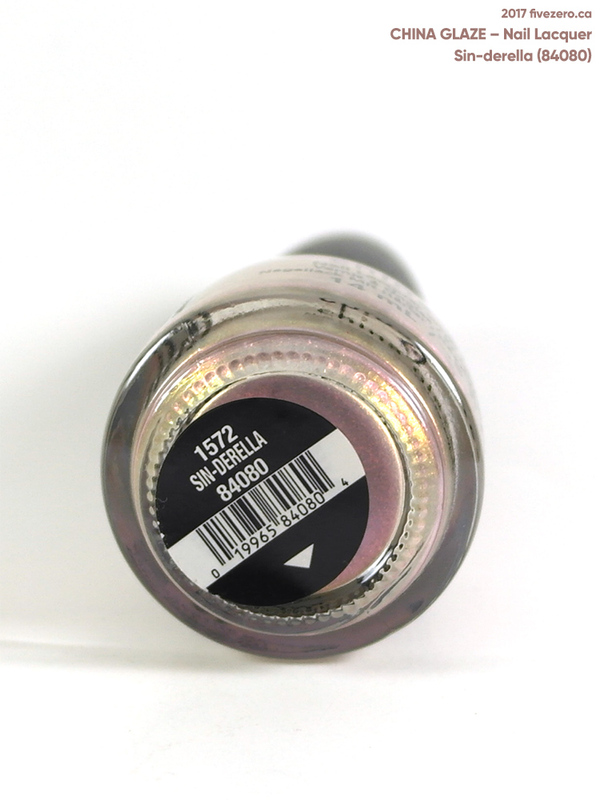 Sin-derella (84080) is a shimmery shade with loads of iridescence. The base color is a beige-y taupe, but it picks up a slightly olive tone with the addition of some fine gold shimmer. It also contains a load of pink shimmer that, in combination with taupe, gives it the look of lavender. This polish is fine. I love it. It’s been a while since I’ve fallen head over heels for a color! The formula is very good, and two coats applies evenly to give full opacity. Yeah, just run out and buy this right now! China Glaze Nail Lacquer retails for US$7.50 and is 0.5 US fl oz / 14 mL. China Glaze nail polishes are free of toluene, added formaldehyde, and dibutyl phthalate (DBP), and are made in the USA. The nail colors (*but not necessarily the treatments) are vegan. China Glaze is cruelty-free. China Glaze is part of American International Industries (who also own brands like Seche, EzFlow and Ardell), a private company based in Los Angeles, CA, USA. I MUST HAVE THIS!!! Love everything about it.